Over the last few weeks I’ve been taking advantage of the somewhat lighter summer routine and doing a little bit of fiction reading…something I don’t usually have much time to do! Last summer, I read A Reluctant Queen, Joan Wolf’s retelling of the story of Esther. When I saw that she had a new title out, I decided to check it out. 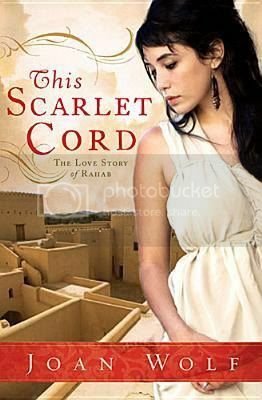 This Scarlet Cord: The Love Story of Rahab is a retelling of the story of Rahab. I was curious to see how this one would sit with me, since I absolutely loved Tessa Afshar’s Pearl in the Sand. I wasn’t sure anything could top that one. Well, I have to say that this one ranks right up there with it! It’s a very unique twist on the story, but I thought it was a fascinating one! Rahab is a young, innocent girl whose family has come to Jericho from their home in the countryside, hoping to find her a husband in the city. Her great beauty has attracted the attention of some of Jericho’s most prominent citizens. Inadvertently, Rahab and her family find themselves caught in a web of palace intrigue and politics, which is also intertwined with the idol worship of the city’s inhabitants. And, with the Israelite army now approaching the city, it’s not safe for them to leave and return to their farm. Meanwhile, Rahab has developed a friendship with Sala (the biblical Salmon) and his father, who are in the city under the pretense of being merchants developing trade connections, when in reality they are collecting information for their fellow Israelites. I had a hard time putting This Scarlet Cord down! The story is creative, compelling, and complex. Life in ancient Jericho and the practices of the Canaanite religion are vividly portrayed. The historical details are obviously well-researched and woven into the story beautifully. The idea that Sala and his father were part of a group of Israelites whose forefathers had never left the area, and were anxiously awaiting the return of those who had been enslaved in Egypt, was a surprising one to me. I’m interested to know if there’s any historical basis for it, since I’d always understood that when Jacob’s family went to Egypt, it encompassed all Israelites at the time…the twelve sons and all their descendants. Even if this point was historical license, it served to add an interesting twist to the story…the possibility that Rahab and Sala had met before, allowing him to plant seeds about the one true God in her mind at a young age that then grew and developed through the circumstances she found herself in. Just as in A Reluctant Queen, Ms. Wolf has created memorable, well-developed characters, each with strengths and flaws. She’s succeeded in bringing the biblical story of Rahab to life in an exciting, heartfelt tale that really captured me. It’s a wonderful blend of romance, intrigue, drama, and faith. If you’re looking for something entertaining yet worthwhile to read this summer, and especially if you enjoy historical and/or biblical fiction, I highly recommend This Scarlet Cord! Thanks so much to Thomas Nelson for providing a copy of this title to me for review purposes! All opinions are my own.